By now this years Feis Ile - Islay Festival of Malt and Music is well under way. One of the visitors is Chris of Hansemalt.de in Germany. As mentioned in the ‘Another Islaymobile?’ entry he brought his car all the way from Germany. 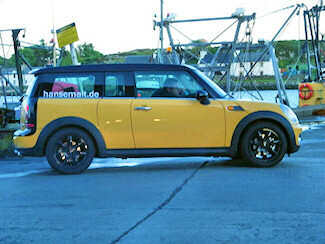 Since I own a Mini Clubman myself (which I call the Islaymobile) I asked if anyone could send me a picture of it on Islay. I hear it has been spotted all over Islay and I've already received two pictures of it. The one above shows it in Port Ellen on Saturday evening, the first picture I received. Yesterday evening I received another one of it just outside of Bruichladdich distillery on Sunday. I'm not entirely sure about the law in Germany and if it allows for vanity plates, but note that the registration reads ‘pint’ (numbers scrambled by me). Makes me wonder if this was just lucky or if he was able to pick it himself? And were the German authorities aware of the irony? The mystery is solved, earlier this evening I received another picture, a picture of the roof of the car. With hindsight I could have thought of it, after all I've seen the design before. Where? 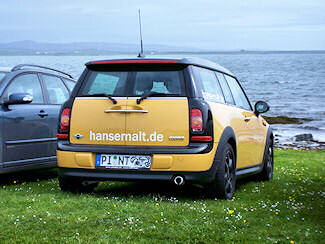 On the hansemalt.de Islay distillery t-shirt I've blogged about in December. It's a quite clever design, you might have to look twice before you get it. Thank you very much to all contributors who have sent pictures and sightings (and Chris for joining in on the fun)!